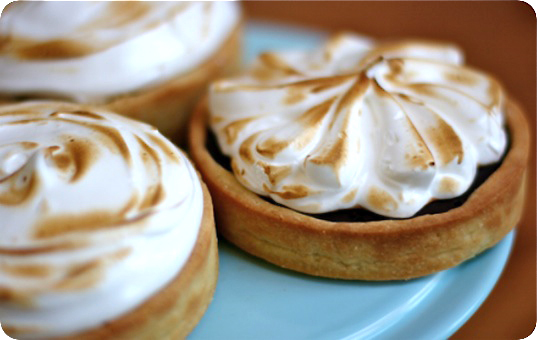 François Payard's Chocolate Meringue Tarts in miniature; photo courtesy of Deep Media. When I was little, I took piano lessons to little success. Even though I could manage to replicate notes on the page, I never had the 'sense' for the keys that makes one feel in ownership of the music. Nonetheless, I would spend the requisite time practicing on the keyboard at home, repeating the disjointed notes over and over until I hoped I had mastered them. It was during these practices that my father would sometimes wander into the room and take over the keys; though wholly self-taught, he had such an ear for music that he could easily reproduce my melodies in their entirety. What's more, he would infuse them with nuance and a character deeper than the notes themselves. In that simple exercise I saw what it mean to be an artist. 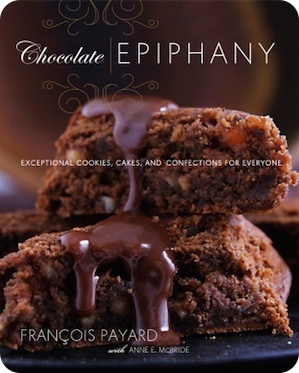 I had a similar feeling of revelation when I had the opportunity to review François Payard's third book, Chocolate Epiphany (Clarkson Potter, 2008). Though a fairly-proficient home baker, I could not help but be awed by the chocolate creations featured within. From the straightforward to the fanciful to the elegant, Payard (with Anne E. McBride) presents confections as beautiful as they are delicious. Though focused solely on chocolate, the book covers a surprising breadth of recipes. After the helpful introductory guide, breakfast and brunch dishes are offered first, followed by chapters highlighting specific dessert forms (cookies, cakes and mousses, among others). The recipes encompass both the traditional and the unexpected, with classic favourites placed alongside inventive combinations of flavours and textures. There is no prejudice regarding chocolate varieties, with white, milk and dark all given the opportunity to shine. As to be expected with his pedigree, the acclaimed pastry chef, James Beard Award winner and owner of a collection of pâtisseries/bistros includes recipes that are somewhat intimidating at first glance. These require a good deal of patience, reasonable skill and, in many cases, specialty equipment. For example, the American Opera Cake calls for no less than four separate component recipes and three pages of instructions. That said, the expertly-detailed steps allow for stunning results that merit the effort. Between the chocolate cake layers Payard ingeniously switches the classic coffee buttercream filling for a peanut version alternated with a decadent peanut butter ganache. If that was not enough, a dark chocolate ganache is finally poured over all. The finished cake is a masterpiece of textures and a show-stopping celebration dessert to say the least. Equally impressive are the Chocolate Pavlovas with Chocolate Mascarpone Mousse. Here Payard innovates by reconfiguring the form from a simple flat base into a full sphere of meringue filled with liqueur-laced mousse and topped with a flourish of mascarpone cream. Again, this is a recipe that one should carefully read before attempting, but the instructions are well laid out, concise and easy to follow. Amongst these rather grand recipes Payard sprinkles in some beatifully-simple ones. Triple Chocolate Financiers (recipe) are a perfect little treat alongside coffee, Chocolate Rice Crispies are a bit of kitchy fun, and Chocolate Blinis elevate breakfast to a whole new level. I was particularly fond of the Chocolate Meringue Tart (pictured, above). A cocoa makeover of the lemon meringue version from his childhood, Payard creates a recipe that is easy to assemble but with outstanding results. His Sweet Tart Dough comes together quickly and is a joy to work with. It is baked until golden, then filled with a luscious dark chocolate filling and crowned with peaks of scorched Swiss Meringue. Absolutely delicious. One caveat, I did end up with an excess of filling even though I followed the recipe to the specific weight measurement of each ingredient. Rounding out the contents is an indispensable chapter of basics; buttercreams, Crème Anglaise, doughs, and often-used base cakes are explained here, with tips and tricks usually only learned with years of experience. For those wishing to replicate the exquisite decorations that adorn many of the desserts, there are also step-by-step directions to creations like chocolate fans, drops, sticks, and shards. The sumptuous photographs by Rogerio Voltan are tempting to say the least; with tightly cropped images that beautifully convey the various textures and elements of the recipes. My only complaint is that I could not find photo captions for the desserts featured on the chapter cover pages. While this information is included in the general index, the omission of labels alongside the specific images might be frustrating to those who find it difficult to match the photos with the corresponding recipe. Nonetheless, Chocolate Epiphany is decadence at its best; truly an opus of cacao bean, with a Maestro's passion and expertise leading the way. Some recipes from the book can be found online here and here. Cover image courtesy Clarkson Potter.